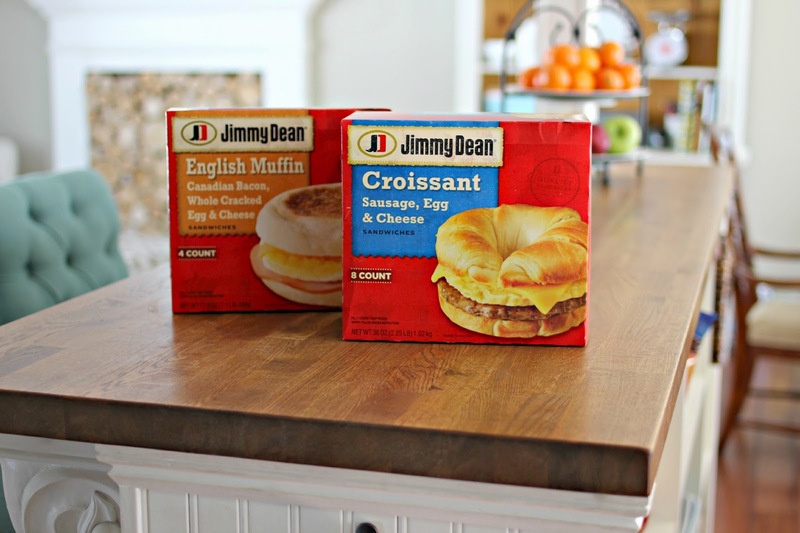 Golden Boys and Me: Easier Weekday Mornings With Jimmy Dean & $100 Visa Gift Card Giveaway! 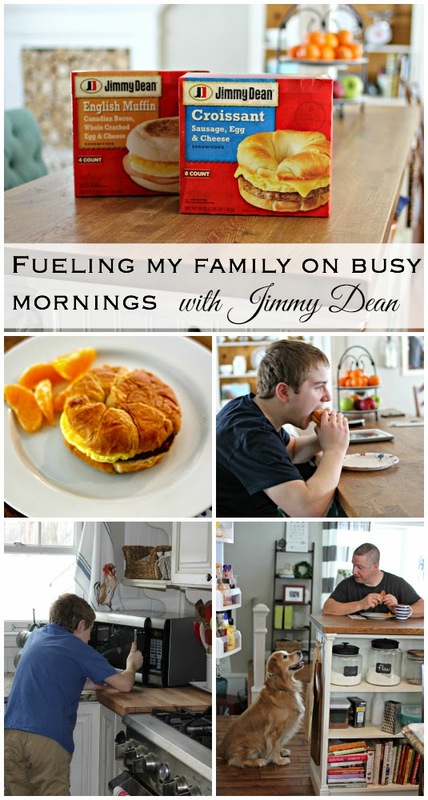 Easier Weekday Mornings With Jimmy Dean & $100 Visa Gift Card Giveaway! Most days, it feels like the main part of my job as a mom to three growing boys is keeping them fed! My kids are 16, 13 and 9 and they have big appetites. On top of that, they each attend different schools with different starting times. They need food fast, especially in the mornings when time is short and everyone is hungry. One of their go-to breakfast items are Jimmy Dean Breakfast sandwiches. 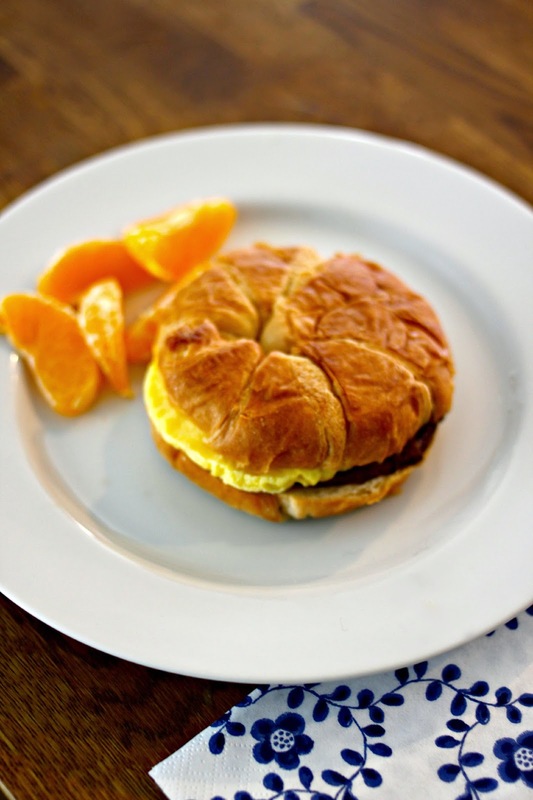 Jimmy Dean breakfast sandwiches are a great-tasting option that provides weekend breakfast taste in weekday time. My boys just aren't as satisfied with a cold bowl of cereal as they are with a hot breakfast, especially during the cold winter months. Neither my husband nor I have the time to cook a hot breakfast for them each and every morning. 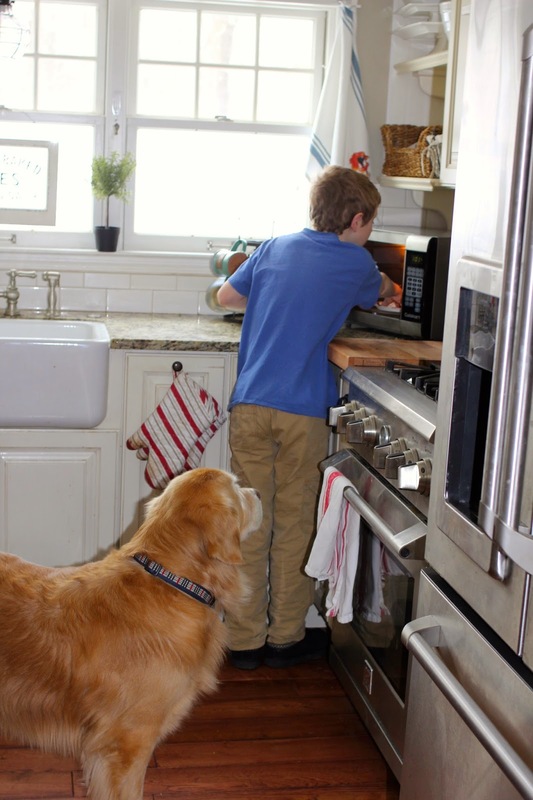 Jimmy Dean sandwiches offer busy families a quick and easy way to enjoy a delicious, warm breakfast from the microwave with less than 3 minutes of prep time. And these sandwiches are easily portable. My boys have been known to eat these sandwiches while waiting at the bus stop, or in the car, waiting in the drop off line at the elementary school. 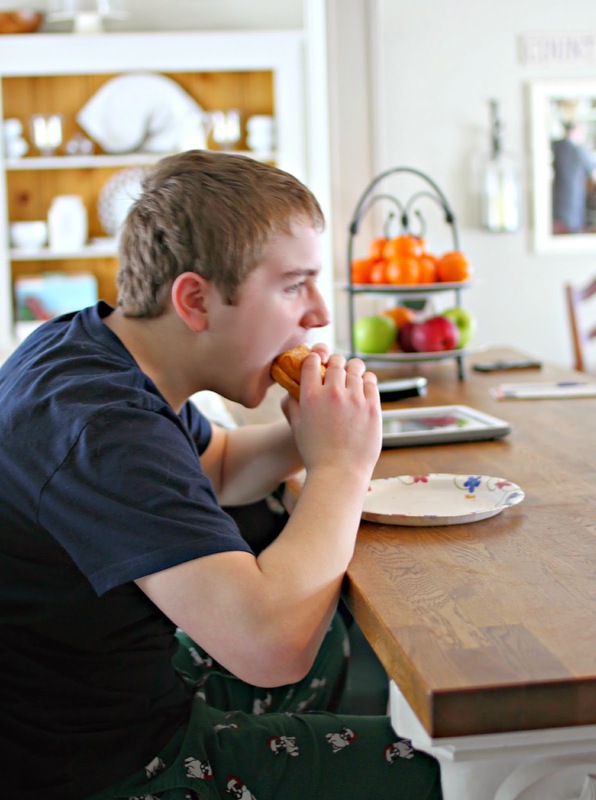 My boys' favorite sandwich is the Sausage, Egg and Cheese Croissant sandwich. The buttery croissant makes this quick meal feel decadent and taste delicious. The sausage, egg and cheese provide a ton of flavor and protein. I feel good knowing they are ready for a productive morning of learning. Even my pickiest eater loves these sandwiches. It makes food shopping easier for me because I know that I am stocking my freezer with foods that they will eat and can prepare themselves. I love that my youngest guy, at 9 years old, can prepare a hot breakfast for himself. I am usually busy getting myself ready for the day while he prepares his breakfast. This is a win-win parenting situation. His independence grows and I actually get to take a shower in peace. My husband, Billy, and I have been watching our calories. Currently, our Jimmy Dean sandwich of choice is the English Muffin with Canadian Bacon, Egg and Cheese. At just 240 calories, it sets the stage for a healthy day. The sandwiches offer a good source of protein to help you get a satisfying start to the day. 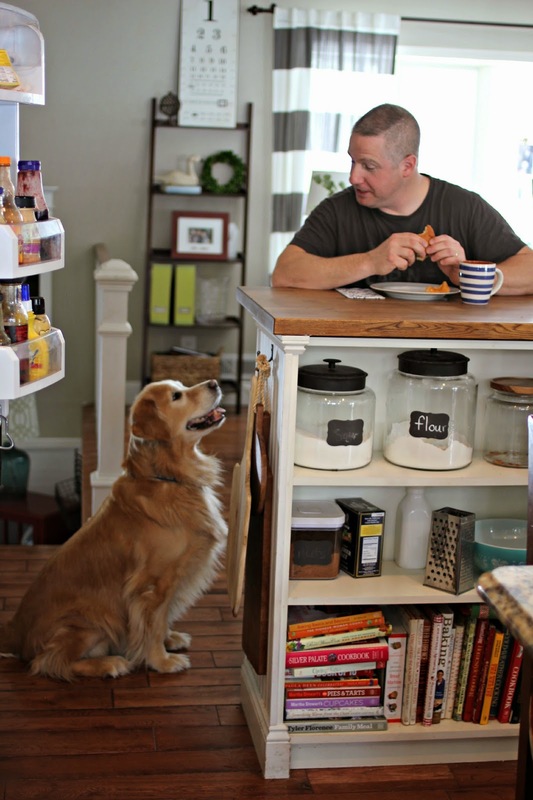 Even our dog, Forrest, loves the smell of these sandwiches and hopes for a leftover morsel to be thrown his way. Sorry Forrest, these are too good to share! To learn more about Jimmy Dean and to see a complete list of product offerings visit Jimmy Dean's website or check out Jimmy Dean's brand page on Facebook. What's your favorite way to start the day off right? Tell me in the comments for a chance to win a $100 Visa gift card. I like to start the day off right with a bowl of cereal and a cup of coffee. My favorite way to start my day off right is by getting a healthy filling breakfast. Hot tea, an English muffin, and a bowl of fruit start my day. I like to start the day off with a yogurt and some juice. We love to snuggle together as a family. I start my day off with a Diet Coke. I like the caffeine jolt. I start out with coffee and then have a light breakfast of oatmeal, fruit or greek yogurt. This is so sweet the picture of Forrest with your hubby. Awwww he just wants a little bite! I am not a big breakfast person but like to have something and I have had these and they are pretty good and low in calories. Hope you have a great Friday and wonderful week end Courtney. I start my work day with a bowl of cereal at home. Then when I get to work I have coffee and a granola bar mid morning to tide me over until lunch. I start my day with a latte and a breakfast sandwich! I usually have a veggie omelet in the morning with a side of sausage or bacon. I think it's good to get protein early in the day. These sandwiches looks awesome and thanks for giving us the calorie info...I know it's nowhere near as unhealthy as a breakfast at a fast food place! i love to make pancakes for the kids! we no longer have a microwave i got tired of cleaning it all the time and threw it out! Honestly, your post title really caught my attention! My morning starts off with me waking anywhere between 4 and 5 (I guess I'm getting old) for a potty and then I know I'm up for the day. I sneak out of the bedroom so as not to wake my hubby and bundled in my robe and slippers I get a cup of coffee with a little hot chocolate and half and half and stumble into the living room, turn on the little fireplace and begin my morning prayers. This is my absolute favorite time of day. By the time I finish, the sun is rising, hubby is up and we start our breakfast of wait for it....Jimmy Dean sausage, eggs and toast. That is why your post caught my eye. We LOVE Jimmmy Dean sausage; have tried other brands but none are as good; in fact we threw the last brand we tried in the trash before we even finished it! It really is good. Thanks for the contest. I enjoy getting my day off to a great start with oatmeal mashed banana walnuts with almond milk. I start the day off right by getting a good night's sleep, and enjoying a hearty breakfast. My favorite way to start the day off right is to enjoy Greek yogurt with blueberries. My favorite way to start my days off are with a large cup of coffee! My favorite way to start the day is with a strong cup of coffee! Coffee, scones, fruit and cheesy eggs!! I rarely start any day off "right" but when I do, it's with a berry smoothie. My favorite way to start my day off right is with a cup of coffee. Thanks for the giveaway! I'm not a morning person so coffee is the first thing I go for. A hot cup of coffee starts my day off right. I like to start my day with a bowl of fresh fruit. I like to get up before everyone and enjoy a hot cup of coffee. I like to start off with a cup of hot black coffee. I like to start the day with an egg, toast and OJ. I Love to start my day off with a cheesey ham and cheese omlette! I love to start off my day stepping outside and breathing in some deep, fresh air. In the fall/winter, this is very invigorating and the quiet is amazing. In the spring/summer, it is a gorgeous cacophony of bird songs. I love it! I start off with oatmeal with blueberries and a cup of coffee! These look great, can't wait to try them! I start out the day with eggs, bacon, cereal and orange juice. I like to start my day with a cup of coffee and read the paper. Than I have a nice breakfast of cereal and toast or eggs and toast. I usually have cereal. I like Special K.
My cat starts my day by purring, followed by me making coffee, toast, and sometimes eggs, heading outside with my dog. I love to start my day with a cup of coffee. My favorite way to start the day is with a nice walk and a piece of fruit. I read my Bible, pray and try to eat a healthy breakfast. I usually start my day with coffee and either a bagel or yogurt. When I'm more motivated I'll make an omelet with bacon or sausage or make waffles. I love to start my day eating breakfast with the family and not rushing everyone. I make sure that the day is completely right with a decent cup of coffee.